You’ve followed the training, then you’ve practiced your nutrition strategy, you’ve completed the long runs, you’ve put together the perfect taper, and you’re ready for success on race day. The last missing piece is the marathon pacing and race strategy. In this article, we’ll walk you through the entire marathon race process and provide a simple pacing calculator so you can customize the pace for your exact goals. If the recent financial crisis has showed us anything, it’s that banks are evil. I’m just kidding, but in all seriousness, the theory of “putting time in the bank” during the first thirteen miles of a marathon race is critically flawed. The bank will take your money and leave you crashing the last 10k just as it did the stock market. I’m not sure where the “time in the bank” theory came from, but the strategy has lead to the demise of more marathon runners than any other source. 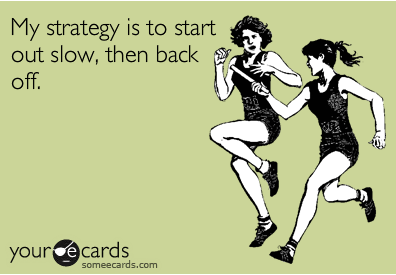 The proper race strategy that will give you the best chance to PR actually follows the exact opposite theory. For a successful marathon race, you should target a pace that is 10 to 15 seconds per mile slower than your goal marathon pace for the first 3 or 4 miles. Here’s an interesting statistic: Every world record from 1500 meters to the marathon has been set running negative splits – running the first half of the race slightly slower than the second half. It’s true, look it up if you have the time. This means that if you want to ensure that you run the fastest time possible, you have to be conservative during the early miles of the race. With the adrenaline and competition, this can be difficult and will require focus. As I discussed in my article on practice makes perfect, you should practice this skill during your training runs. You can do this by entering tune-up races to simulate the adrenaline and fast pacing of early races. You can also accomplish this on training runs with strict adherence to pace, learning how these efforts feel, and by using cutdown tempo runs. Why does running Slower the first half of a marathon work? (2) running slower gives your body a better chance to absorb and take on fuel and fluids. Just like a car, the faster you run, the more fuel you burn. Almost everyone has seen the effects of fuel consumption while driving at 80mph versus 55mph. Your body reacts in a similar way. When you run over your marathon pace (scientifically defined as your aerobic threshold), you start to burn significantly more carbohydrates. Similarly, as I discussed earlier, weaving in and out of other runners the first few miles, which tends to happen more with runners who go out too fast, is like driving your car in the city. We all know cars get significantly reduced miles per gallon while driving in the city. Your body is the same way. Your body can store enough fuel to run about 2 hours at marathon pace. This means unless you’re running really fast, you’ll need to take on a lot of extra carbohydrates during you run. Your body has a difficult time digesting the carbohydrates you take in while running. As your body becomes increasingly stressed, it begins to shut down non-essential functions such as the digestive system. So, while you could be consuming enough energy gels to keep a small nation alive, they may not be getting processed by your body – it’s kind of like putting leaded fuel into your automobile. The best way to combat this unfortunate bodily function (besides practicing taking gels and fluids in practice) is to take on carbohydrates in fluids early in the race when your body is feeling good and not stressed. If you started the race a little slower, you’ll have a chance to absorb more of the nutrition you take on board. In addition to running the first 3 or 4 miles a bit slower than marathon pace, it is important that you stay relaxed while running in the big crowds and passing runners that you need to go around. Surging past slower runners and getting uncomfortable in the tight crowds is an easy way to ruin your race. All the surges and stopping and starting requires a lot of energy. Energy = fuel, so the more energy and fuel you burn up during the first few miles, the less you’ll have over the last 10k. Try your best to set yourself in the right corral and when the race starts, relax and go with the flow until a natural opening for running appears. As you’ve learned already, you should be planning on being a little slow for the first few miles anyway, so take a deep breath and focus on relaxing. We’ve included a nifty pacing chart in this article so you can easily visualize exactly how you should plan out and pace your race. One important thing to remember is that races can be kind of wild sometimes and everything might not go to plan. It’s important to remember to stay relaxed and that these numbers are just a guideline. Focus on being as accurate to the average pace as possible, relaxing, and running as hard as you can the last few miles. As noted earlier, you want to be about 10-15 seconds per mile slow of your goal marathon pace the first 3-4 miles (4 to 7 seconds slow per KM). Remember that it will feel “slow” and you might be getting passed by people you want to beat. While it is mentally difficult, this is by the most effective way to run a race and you’ll tear by those people during the last few miles. 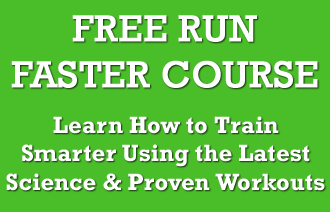 After the first 3 or 4 miles (5-6km), slowly creep your pace towards your goal marathon pace. It’s still ok to be a little slow in these miles as your conserved energy will allow you to hold pace the last 10k and avoid the dreaded marathon fade and bonk. During this time, you should concentrate on eating and drinking whenever possible and as much as you know your stomach can handle. You definitely want to put energy in the bank. You should have already found a group that is running your pace or a little faster. Work with the people around you and latch on when you’re going through a rough spell. Try to relax and keep your focus on staying with the group, not your splits. Use the group and the people around you to help you relax and take your mind of the distance ahead. This is one of the hardest parts of the race as it requires a lot of mental focus and fortitude. Be aware that you need to increase your effort to maintain the same pace or run faster as the race goes on. As you get more tired, it gets more difficult to keep running faster, so you have to try harder. I’m not a coach that sugar coats training and racing. The last 7k of a marathon is tough. Sorry folks, there is no way around it. From a race strategy perspective, if you’ve done the training, were conservative over the first few miles, and taken adequate fluids and carbohydrates, you’re going run well the last 10k. However, to help along the way, I suggest implementing simple mental tricks. Keep you mind and body relaxed. Look within yourself and focus on you. Think confident thoughts and repeat confident mantras to yourself; “I am fast, this feels good” or “I am strong, I’m running great”. Every time you feel tired or feel the pace slip, repeat to yourself that you need to refocus and concentrate and get back on pace. Often times, I’ll watch a video of fast marathon runners and when I start to hurt, I’ll imagine myself running like them. Good form – head straight, arms swinging forward and back slightly, powerful strides. Just having the mental imagery of good form helps me maintain my pace when the muscles become increasingly tired with each step. If the pace starts to slip, I’ll throw in a surge to get my legs fired up again. Sometimes all it takes is a small burst of speed to reinvigorate your legs and pace. If you’ve done surges during your long run, this will be just like practice for you. Finally, I try to break the remaining distance into bite size and easily digestible pieces. After doing lots of hard training runs, I’ll break the race up into one of my best previous workout sessions. For example, if I had a great 2 x 3 mile session, I’ll remember how it felt and think to myself, “hey, I did this workout before, let’s get back on pace and do it again”. Likewise, sometimes a mile can seem like a long distance, so I’ll break it down into a time instead. Thinking I only have 3-4 minutes until I hit the halfway point of a mile makes it seem a lot easier. 4 minutes is nothing! I know this is the typical pre-race comment, but it’s true. Running and racing are about having fun and enjoying yourself, so remember that when you start getting nervous about the race. If you’ve done the training and followed all our advice, you’re going to run well. Enjoy the challenge and the atmosphere! Great article but there is someting amiss in your calculator or I am reading it wrong. For a 3:35 it shows an average pace of 8:35 at mile 22 (3:08:51/22 miles) and that you have to finish “as fast as you can” …you don’t really expect anyone to run 6:17 min/mile for the last 4.2 miles (3:35 – 3:08:51/4.2 miles) to get back to the 8:12 required pace? I checked it for 3:30 same issues (8:23 overall at 22 miles and needing a 6:04 to bring it back to the 3:30 goal @ 8:01/mile). I think your overall times are for mile 23 and you finish the last 3.2 miles in the time remaining…correct? Yes – I concur with the above comment. The (very helpful) calculator should just read Final 3.2 miles not 4.2. Thanks for this. Do you have a metric version of it?